The Poles hang back, moving their bows into position in the woods (top left) while the Russians advance. Note the Russians glow a faint red, while the Polish glow a faint blue. Having learned well from his previous encounters with the Polish, Mistislav aimed his forces away from the cursed bowmen and toward the line of Polish knights that stood backed up by spearmen in the centre of the battlefield. He ordered his foot troops to march through a marsh on the right and his light horse to go around a forest and attack the Polish camp. Meanwhile, the Polish moved slowly into position, focusing most of their tactical actions on the archers that hid inside the trees (top left of the above picture). Polish glow a faint blue. The Russian light horse made their way to the Polish camp with frightening speed. 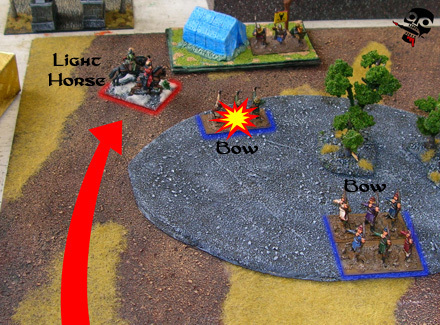 The Polish responded by dispatching a single element of bowmen to stop them. The battle for the Polish camp raged for the entire length of the battle itself, never to be won. However, in the fighting that took place behind the forest, the Russian light horse did eventually manage to destroy the Polish bowmen. The lines colide, both sides take losses. Note the Russians glow a faint red, while the Polish glow a faint blue. The lines are further broken as another Polish knight is destroyed. The battle continued as Mistislav himself, along with his personal guard drove through the Polish general and his Polish knights. Much woe spread through the lines of the Poles, but instead of breaking, it only seemed to cement their resolve! 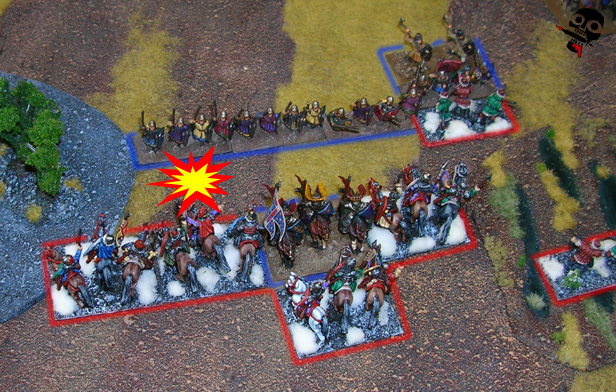 The battle did not go so well for his fellow cavalrymen however, as the Polish knights forced them back! 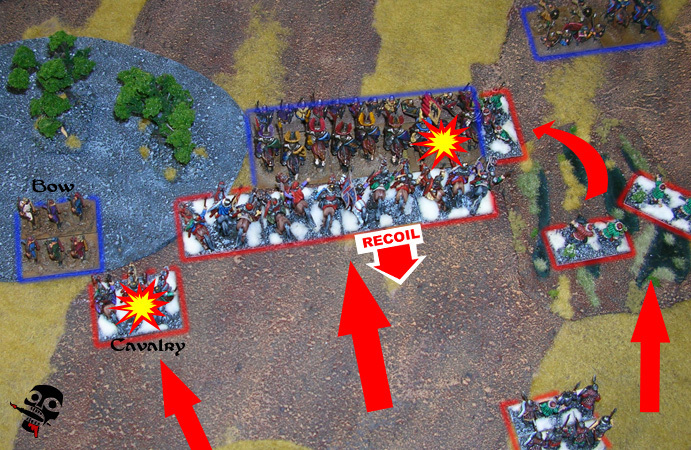 Unfortunately for the Polish, their headlong pursuit of the Russian cavalry put them in a compromising position in the middle of the Russian lines! 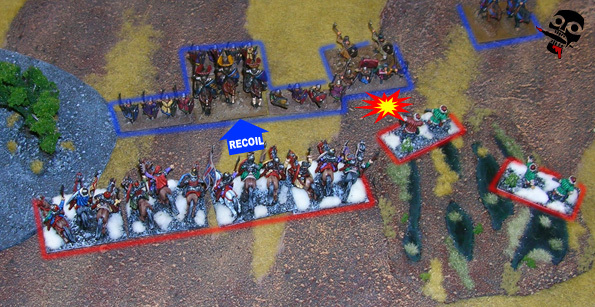 After much battling, the line of Russian and Polish horsemen wore down to an extended draw, while the Russian woodsmen were destroyed by polish spear. Mistislav's cavalry fought tooth and nail against the Polish, but the Polish replied in kind. Neither side was able to gain the advantage in the main battle line. Unfortunately for Mistislav however, his woodsmen (2Ax) were caught beyond the Russian lines by psiloi supported Polish spearmen. Though the battling was hot, the woodsmen could not hold their ground in the open and were cut down by the polish spearmen. 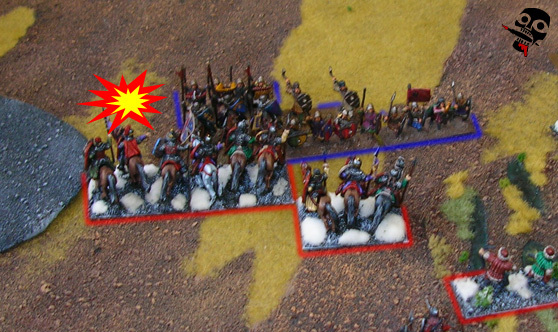 As the battle raged, and the main line fought to a stand still, the Polish bowmen destroyed an element of Russian cavalry! Finally, the Russians manage to break the Polish flank and win the battle. Enraged at the potential brink of defeat that he faced, Mistislav drove his guard forward against the Polish lines. 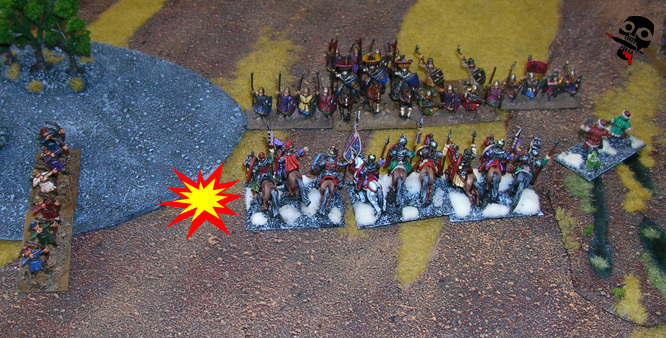 Their impetus slammed through the Polish spearmen, crushing the Polish flank and forcing the remaining Polish army to flee in defeat! At their defeat, Mistislav marched into his former city to reclaim it, and the people rejoiced! Well... the people that paid fealty Mistislav rejoiced, everyone else was treated very poorly as their property was taken for the good of Mistislav's coffers!